Moses thought it was bad when he was performing the largest jailbreak in the history of humanity, liberating the Israelites from Egypt. But he hadn’t taken into consideration what life would be like when he was actually leading this group of newly-liberated ex-slaves around house-hunting. Seriously, if Moses had a low deodorant kind of day, the freedom trail might have ended right there with the Amalekites slaughtering Joshua’s ragtag army at Rephidim. But Moses was rolling with Degree that day, and as long as his arms kept his hands in the air like he just didn’t (or did) care, the Israelites won. If his arms drooped, they were going to lose. So, Moses’ number two and three lieutenants, Aaron and Hur, held up his arms. Then things get even more interesting than a couple of arms in the air: Moses’ father-in-law arrives to give him advice. 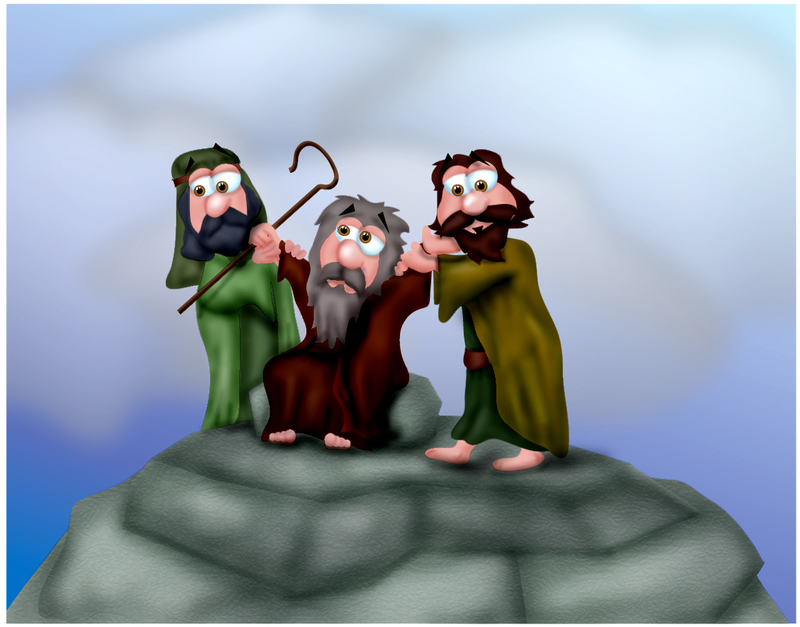 While Jethro is visiting, he observes Moses sit as the sole decider of every issue that the Israelites face. Petty stuff like where to park their camel, disagreements over the right way to wear their tassels, family squabbles over inheritances, frustration over the missing sheep and cattle. Every last thing, from circuit court material to Judge Judy episodes, Moses was judge, jury, and executioner. Now, Jethro, an outsider who didn’t believe in God, had just converted because of Moses’ testimony (Ex. 18:10-12), but his worldly experience told him that Moses couldn’t sustain the practice of handling every little detail. “What you’re doing is not good. You and these people who come to you will only wear yourselves out. The work is too heavy for you; you cannot handle it alone,” Jethro said. “You must be the people’s representative before God and bring their disputes to him. Teach them his decrees and instructions, and show them the way they are to live and how to behave. Select capable men from all the people–men who fear God, trustworthy men, who hate dishonest gain–and appoint them as officials” (Ex. 18:17-22). This is solid advice from an older man who has seen the world, instructing his younger ‘son’ in the ways he can be a better leader. It’s practical but it’s also theological, because Jethro says, “If you will do this and God commands..” And it is followed up, compounded, launched off of by the Ten Commandments of Exodus 20. (Not to be confused with ten suggestions, options, or possibilities, but ten commands.) I’ve never heard it preached about this way, but before there were the Ten Commandments, Moses tried to do it on his own. And then there’s the big picture: God wouldn’t (or didn’t) deliver the Ten Commandments that the Israelites were to live their lives by until someone was ready to receive them. But when Moses was ready to leave, God delivered the “ten words.” Having just preached an eleven-week sermon series on the Ten Commandments, I’ll leave those well enough alone. But you can check them out starting here, if that’s of interest. Suffice to say, all of the commandments are about God, but they’re also about family, community, and society as a whole. Again, pouring out of one man’s recognizing that he could not bear the weight of judgment alone. Suddenly, as Moses delivers the Ten Commandments, the people get it – Moses is different from them, because God has chosen him. “Speak to us yourself and we will listen,” the people said. “But do not have God speak to us or we will die” (Ex. 20:19). Being God’s “first man” put Adam in a position (post-eating of the fruit of the tree of the knowledge of good and evil) carried responsibility and consequences, and for Moses, those same weights are now passed down to him even more than when he was wrestling Pharaoh. From raising up his arms to delivering the rules that would govern the Israelite society, Moses is discovering what it means to be a leader for God. In the process, we might learn something about the power of prayer, and of mentoring, for ourselves. This entry was posted in Bible Says What, Books and tagged Joshua, Moses, Ten Commandments. Bookmark the permalink.